The Girl in the Spider’s Web: A New Dragon Tattoo Story is Fede Alvarez’s new movie installment based on Steig Larson’s Millenium series. This film is based on the fourth novel written by David Lagercrantz who took over the series after Larson’s sudden death in 2004. Many have claimed the later installments from Lagercrantz lost the essence of what Larson brought to the series in an effort to turn the series into an action franchise. After viewing The Girl in the Spider’s Web last night I would, unfortunately, would have to say the same for the film. The Girl in the Spider’s Web tasks Lisbeth (Claire Foy) with the job of stealing a file called Firefall from the Americans, more specifically from Agent Edwin Needham who is portrayed by Lakeith Stanfield. As Lisbeth completes her task, it is quickly stolen from her which unfolds subplot after subplot as the movie tries too hard to become an action thriller instead of focusing on how the character’s backstories have led them all to the hunt for Firefall. I have to say Claire Foy completely transforms for the role of Lisbeth and commits to the material but due to poor writing, I left wondering why Alvarez would waste such a brilliant talent. Another talent wasted would have to be Lakeith Stanfield. As the Special Division agent for the American government, Stanfield is reduced to a few funny one-liners as we never understand why it is necessary for him alone to retrieve Firefall. Stanfield does, however, provide some amazing sniping skills towards the third act of the film which for a moment relieved me of the films’ monotony. What I loved about David Fincher’s 2011 take on The Girl with the Dragon Tattoo was his investment on the character development of Lisbeth then portrayed by Rooney Mara. As the audience learned more about the assault and trauma that Lisbeth had to endure from an early age into adulthood we understood her gravitation to her life as a vigilante. 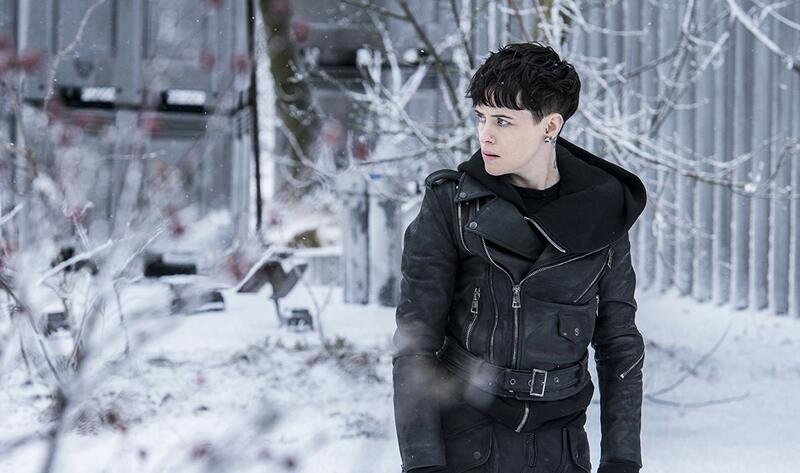 Instead for The Girl in the Spider’s Web, we are given an empty story of a sister’s betrayal between Lisbeth (Claire Foy) and Camilla (Sylvia Hoeks) which leads us to nowhere until the final moments of the film. Overall, I was bored to death while watching this film. However, this is no fault to the incredible talents of Foy and Stanfield, who do their best with the material given to them. Where The Girl in the Spider’s Web goes wrong is the intense need to turn this thriller into an action franchise instead of getting the audience invested in its characters. By the end of the film, moviegoers will be left wanting their time back instead of caring where Lisbeth Salander’s next job leads her. My recommendation is you WAIT to see this film in theaters. Want to decide for yourself whether or not you should see The Girl in the Spider’s Web? Click here to grab your tickets from Fandango so you don’t get sold out! Have you seen The Girl in the Spider’s Web? Share your thoughts on the film in the comment section below. That’s disheartening. I was hoping this would be a good one to see. I did hear from other sources that it was worth the watch though. So maybe I’ll watch it once it’s on Netflix. I had a feeling this wouldn’t be good. A bummer since Claire and Lakeith are really talented. I still might go check it out on like a lazy Sunday. I wasn’t sure about the movie either but I wanted to give a chance because the one with Daniel Craig was decent. But the trailer did kinda seem like it was all over the place. Thanks for the review. I’m sorry you were bored. I actually enjoyed it. You do bring up a good point about the waste of a character with Lakieth Stanfield. Never really understood the point of his character. I thought that this would be a good movie, but glad I didn’t waste my time! Thanks for your review! Well I needed more action. I think the movie was good, but I think Claire Foy and her Sistet back story would have been a more interesting movie. Mmm, I enjoyed the James Bond like intro to the film after the opening scene with the sisters. After that I thought okay, let’s see where this goes. I actually enjoyed this movie. I did find the rogue American agent questionable and how he found some evidence after the local law enforcement searched the scene to be poor police work on their part. However, hey willling-suspension-of-disbelief!! I enjoyed it and would recommend paying if this is ur type of movie. interesting. I thought this would be a good movie.. I do look forward to perhaps checking it out Thanksgiving week.